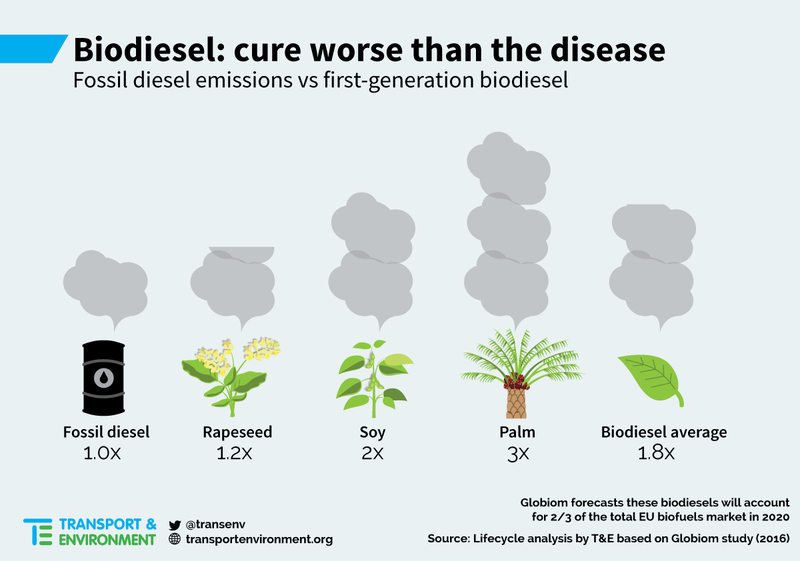 Instead of reducing them, using biodiesel in transport will increase polluting emissions by 4%, the same as putting an extra 12 million cars on the road in 2020, green campaigners have said. Biodiesel is touted as one way to decarbonise the EU’s transport sector. But, according to NGO Transport and Environment (T&E), using it is actually worse for the environment than traditional fossil fuels. Transport is responsible for around a quarter of the EU’s greenhouse gas emissions, making it the second-biggest emitting sector after energy. It is the only major EU sector where emissions today are well above their 1990 levels, making its decarbonisation vital if the EU is to hit its climate change goals. T&E’s analysis builds on the long-delayed and controversial Globiom study, that was finally published last month. Critics have accused the European Commission of keeping the study, which was commissioned in 2013, under-wraps until the consultation period for the review of the Renewable Energy Directive (RED) was over. A consortium of three respected research institutes, including Ecofys and IIASA and e4Tech, wrote the study. But the findings were denied by Raffaello Garofalo, the secretary general of the European Biodiesel Board, an industry group, who branded the study “unreliable”. “We are quite surprised by the biased campaign set-up by T&E,” said Garofalo who accused T&E of lobbying “against biodiesel and in favour of fossil fuels.” A graph released by T&E indeed shows fossil fuels emitting less than rapeseed, soy or palm oil. 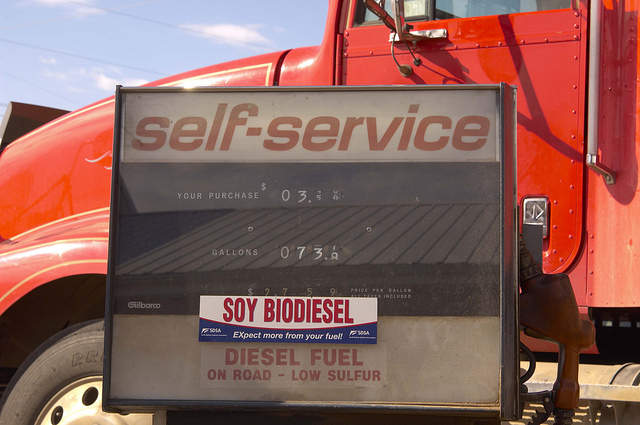 Vegetable oils from crops such as palm, rapeseed and soy are blended with fossil diesel to create biodiesel. 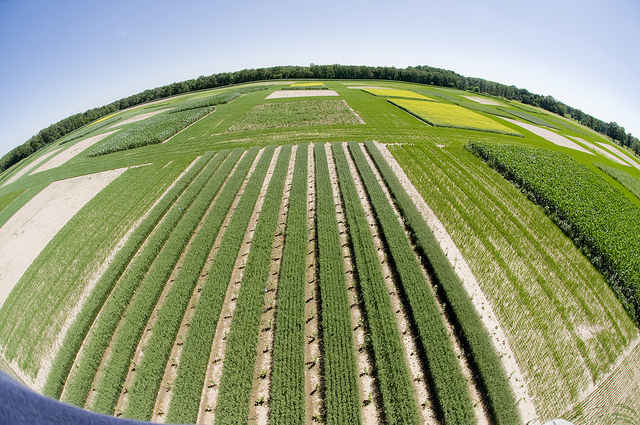 But those three crops cause direct and indirect land-use change (ILUC) emissions when new or existing cropland is used for biofuels instead of food, according to the study. Those emissions alone exceed the full lifecycle emissions of fossil diesel, according to T&E. ILUC is a way of measuring the impact of the displaced agriculture being moved to grasslands and forests, which absorb high levels of global warming CO2. Turning such carbon sinks into crops increases the CO2 in the atmosphere. T&E took the findings of the study added the direct emissions of biofuels from, for example, tractors and fertilisers, and subtracted the emissions from the alternative fossil fuel. In total more than three-quarters of biofuels, which includes bioethanol as well as biodiesel, are forecast to have lifecycle greenhouse gas emissions similar or higher than fossil petrol and diesel in 2020. The EU reformed its biofuels policy last year, capping the contribution of food crops to biofuels at 7%. T&E took the cap, which was revised up from the Commission’s proposed 5% in talks between the European Parliament and Council, into account in their analysis. But ILUC emissions are not included in the carbon accounting of biofuels under the RED, currently under review with fresh legislation expected before the end of the year, and Fuel Quality Directive. This means that ILUC-causing biofuels count towards the EU’s 2020 RED target, and can be eligible for public money at national level. By 2020, 10% of energy used in transport in each member state has to be produced from renewable energy sources, such as biofuels, biogas, electricity or other renewable sources. Dings said, “The cure is plainly worse than the disease. The 7% cap on food-based biofuels has helped though, and should be lowered to zero after 2020. But the EBB’s Garofalo attacked the GLOBIUM study, saying it does not represent the views of the Commission, although it was funded by it. “By ignoring the lack of credibility of the GLOBIOM modelling, and calling for a 0% cap on first-generation biofuels after 2020, T&E is actually advocating for more fossil fuels in road transport,” Garofalo said. Rather, Garofalo prefers referring to another model developed by the California Air Resources Board (CARB), which he said was a more reliable, “open and peer-reviewed process”. CARB is the same agency that investigated recent cars’ emissions rules violations in the US. “The CARB ILUC model is an open and peer-reviewed process, which resulted in ILUC values for biodiesel that are four to five times lower than those found by the GLOBIOM study,” Garofalo said. euractiv.com yesterday (25 April) asked the Commission for comment. ePURE's (European Renewable Ethanol) secretary general Robert Wright said, "GLOBIOM confirms the findings of the International Food Policy Research Institute that European renewable ethanol has high net greenhouse gas savings compared to the petrol it replaces, and low risk of adverse land use change impacts. This T&E analysis confirms this, although it fails to apply GLOBIOM’s findings to the reality of the European market, leading them to reach the wrong policy conclusions. "Calling for a phase out of all form of support for all conventional biofuels ignores the GHG savings credentials of European ethanol and only results in more polluting fossil fuels being used. During the ILUC debate T&E called for land-using biofuels to be capped, including the energy crops they now appear to support. This analysis is yet another example of their tendency to ‘throw the baby out with the bathwater’, denying the existence of valid options to decarbonise transport available at scale. 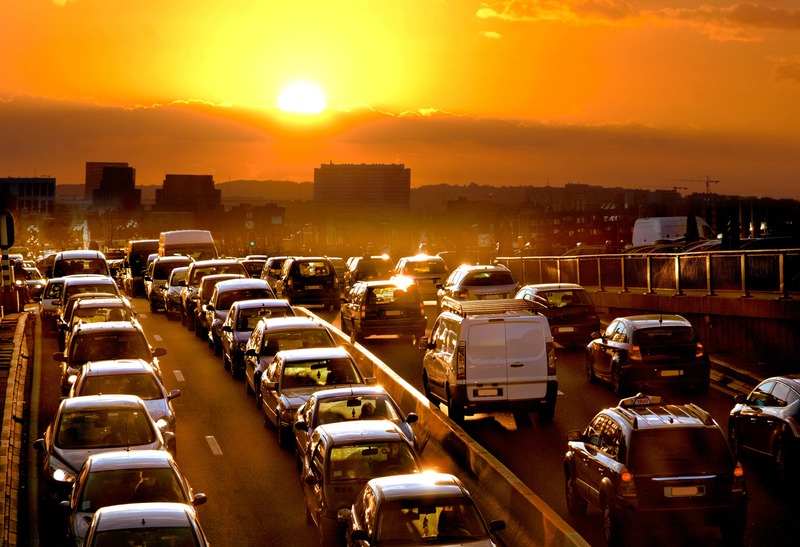 Transport is responsible for around a quarter of the EU's greenhouse gas emissions, making it the second-biggest emitting sector after energy. It is the only major EU sector where emissions today are well above their 1990 levels. While greenhouse gas emissions from non-transport sectors fell 15% between 1990 and 2007, transport emissions increased by 33% over the same period. They have started falling only recently due to high oil prices and improved vehicle efficiency. More than two thirds of transport-related greenhouse gas emissions are from road transport, which contributes about 20% of the EU's total emissions of CO2. Significant reductions in these emissions from transport are needed if the EU is to achieve its long-term climate goals. Analysis: Globiom study: the basis for biofuels policy post 2020. We can all agree that EU has failed in the issue of biodiesel. There are 30 million hectars farmland abandoned and another 10 millions at risk to be abandoned – which could have been used for producing biofuel with no ILUC effect at all. Using this land and best available, commercial practise for biodiesel would reduce emissions by 60-70 %. The very same report also show that current production of ethanol from grain has very little harmful effects – and as is shown by commercial examples – can easily be reduced to almost nil by a wise use of byproducts. So the policy options are clear: let us take this chance to both save Europes biological diversity (50 % of redlisted species are dependent of exactly the kind of farms that are abandoned) AND take serious steps towards a fossil-free transport sector AND reduce the use of oversea soy meal which indirectly threatens rain forest.